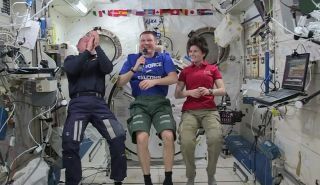 Barry "Butch" Wilmore, Terry Virts and Samantha Cristoforetti give an in-flight interview on Jan. 28, 2015. When more than 100 million people on Earth tune in for the Super Bowl kick-off this Sunday, NASA's astronauts in space will probably be sleeping. But two the American astronauts living and working on the International Space Station are football fans, and at least one of them says he hopes to wake up in time to see the end of the Super Bowl matchup between the New England Patriots or the Seattle Seahawks. "Grilling" for Wilmore probably means heating up some freeze-dried or thermostabilized packaged food with warm water. There are no microwaves or ovens on the space station, and definitely no grills. Open flames aren't allowed inside the orbiting lab. It's not possible for the astronauts to live on a typical day-night cycle. Their orbiting home circles Earth every 90 minutes, and they might witness up to 16 sunrises and sunsets each day. They live on Greenwich Mean Time, or GMT, and the 6:30 p.m. EST kick-off time actually occurs about two hours after the start of their bedtime, said NASA spokesman Dan Huot. If astronauts are awake, the game will be uplinked to them live. "Not clear on who they will be rooting for," Huot said in an email. "Wilmore is from Tennessee and a big Titans fan and Virts has been wearing his Texans gear lately." Virts posted a picture of himself on Twitter last week sporting a J.J. Watt Houston Texans shirt while looking down at Earth from the space station's cupola. The Texans didn't make it to the playoffs this year. Nonetheless, Virts wrote that Watt is "the best football player on Earth." Wilmore isn't just a football fan; he's also a former college football star. He was a linebacker for Tennessee Tech's Golden Eagles. With 143 tackles, he ranks third on the team's all-time tackles list, and he was inducted into the school's "Sports Hall of Fame" in 2003. Virts joked during this week's interview that it's "probably safe to say" that Wilmore is the best football player in space. But Italian astronaut Samantha Cristoforetti, of the European Space Agency, "is the greatest European football player, as we call soccer, on the station." Wilmore, Virts and Cristoforetti are currently living on the $100-billion space station with three Russian cosmonauts, Elena Serova, Alexander Samoukutyaev and Anton Shkaplerov. Wilmore, Serova and Samoukutyaev are scheduled to come back to Earth in March. They'll be replaced by the next three crewmembers as part of a rotating system of that has kept the space station continuously occupied since 2000.